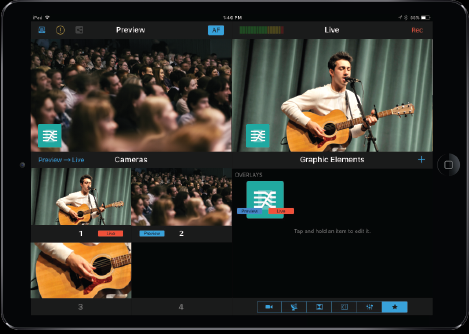 BoxCast opens its Platform for Switcher Studio integration. CLEVELAND, OH (November 2, 2016) – BoxCast announced its partnership with Switcher Studio to bring professional streaming solutions to organizations that require higher video production value and more sophisticated live delivery capabilities than are currently available on the market today from free streaming services and solutions. As a result of this partnership, BoxCast has opened its platform to Switcher Studio, enabling users to leverage the BoxCast platform to stream their events with professional results. Additionally, existing BoxCast customers can improve production value in a bundled deal with Switcher Studio. This means that small businesses, corporate enterprises, schools and universities, sports and news broadcasters can all create high production-value live content using Switcher Studio and the Boxcast platform for broad distribution on the Internet. Users can also take advantage of BoxCast’s pre-roll video ad management tools and special embedding options to monetize their content. The BoxCast Switcher app is available in the iTunes App Store. Each BoxCast Switcher license requires a standard BoxCast streaming subscription. BoxCast is a breakthrough streaming platform that makes it easy for organizations to deliver live, HD video to anyone, anywhere, on any device. Launched in 2013, BoxCast is headquartered in Cleveland, OH. For more information about the company or to start streaming your organization’s events, please visit www.boxcast.com. Switcher Studio was started by a team of people who love creating and delivering great video content - from anywhere and from any device. The solution was born from a passion to democratize what was once an incredibly complex and expensive experience, to one that enables anyone to create professional looking video and instantly stream live video to services like YouTube and Facebook. For more information or to start creating amazing multicam streaming events, please visit www.switcherstudio.com.